With the July 25th premiere date of Castle Rock just days away, the writers of Hulu’s Stephen King-inspired horror series joined With An Accent and other outlets at San Diego Comic Con to preview the chills to come. Check out the video and read the responses below. For those who are still unclear what the show itself is about, writer Sam Shaw explained, “This first season has a kind of mystery story that unfolds over the course of ten episodes. It begins with a kind of spectacular death that leads to a discovery in the bowels of Shawshank Prison of an extra prisoner.” If Shawshank sounds like one of your favorite Stephen King stories, that’s because it is. “His discovery ropes in André Holland’s character, Henry Deaver, who’s a kid who grew up in the town of Castle Rock, the bad luck town that readers of Stephen King know and love,” Shaw continued. 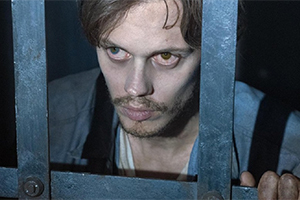 Bill Skarsgård’s mysterious prisoner turns Shawhank and Castle Rock upside down. Fellow writer Dustin Thomason added that Castle Rock‘s brand of horror will very much follow King’s own style. “Stephen King is a writer who kind of does it all, and part of what we wanted to do on this show was deliver on the psychological suspense, the creepiness, and at times hopefully the grab-you-by-the-throat scares.” Thomason went on to say that the early episodes will focus on building the world of the town, but that everyday human horrors would come into play before presumably branching out in more unusual scares. In fact, Shaw chipped in to tease the escalation of fear from the simple to the supernatural. “The premise, at least in the first hour or so, is pretty wild and outlandish but not overtly paranormal. And then the story gets progressively weirder and more disturbing as it goes. One thing we love about Stephen King is when you embark on the journey and think that you’re reading one kind of story, and by the time you arrive at the end you’ve lost all your bearings and are off in some completely bizarre alternate place you wouldn’t have anticipated. That was a goal for us in making the season.” If that doesn’t send chills down your spine, nothing will. Shaw agreed with his partner, adding, “So many of us came to those books when we were teenagers, at a very tender age, they’re sort of shot through with this contact shot of nostalgia. So part of what was fun and interesting about the challenge of making the show was to try to tell a contemporary Stephen King story. To try to imagine what Shawshank would look like in 2018, what it would look like to tell a story about the privatization of a prison and what the sort of economic pressures of a prison are.” Not to mention to reintroduce the world to Alan Pangborn (Scott Glenn). a hero of novels from the 80s and 90s, like The Dark Half. What are you most excited about when it comes to the show? Let us know in the comments below, and don’t forget to come back to withanaccent.com for more discussions with the cast of Castle Rock and plenty of other shows!